Holidu GmbH operates an online platform that greatly simplifies the search for holiday homes and apartments for travelers. With the help of the developed search engine, users can simultaneously look for the best accommodation on several portals. The platform searches through partner portals for matching offers and compares them. This thus makes it possible to easily and comfortably find the most convenient and cheapest offer. Johannes Siebers is a co-founder of Holidu. We interviewed him about the idea behind Holidu, its founding period, and future prospects. What does your company stand for? Holidu offers a search engine for holiday homes and apartments. Our vision is to develop the best search site for apartments in the world. Holiday apartments are very trendy and are a major growth market. The search for holiday apartments is however very time-consuming since there are so many portals with very different offers. Holidu develops a meta-search where users can compare the prices and offers from all the major portals. Where and how did you get this brilliant idea? We were planning to visit Portugal for a surfing holiday with friends and were searching for a nice beach house. This took us several nights since going through the numerous different portals for holiday apartments was somehow sophisticated. We wondered why the search for a holiday apartment is often relatively harder compared to booking a flight or a hotel. It is for this reason that we decided to come up with a meta-search for holiday apartments where users can find and compare offers from all the major portals in a single search. How did your founding team come together? My brother Michael and I have always wanted to establish something on our own. Michael’s technical background and my experiences from the Venture Capital field complement each other perfectly. 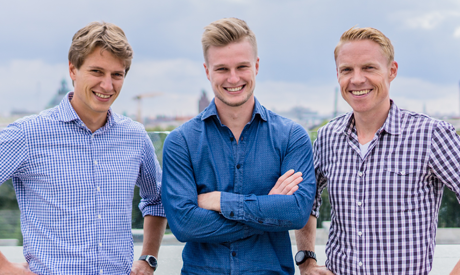 We met our third co-founder, Rasmus Porsgaard, through one of our business angels. He had years of experience in online marketing in start-ups and had just moved to Munich from San Francisco when we founded Holidu. Working together on Holidu was very fun and we know that we can rely on each other fully. What would you say are the benefits of being your own boss? Working on your own ideas and getting to realize them is simply fascinating. You take many small steps and, all of a sudden, you get to that next major level. In such a process, work does not feel like work anymore. What do you think are the properties that one should have to be a successful entrepreneur? The first and most important step: one needs to establish and engage himself/herself fully in the process. One should also persistently work on his/her own ideas and always have a future-oriented mindset. Of course there are going to be a couple of setbacks. Some of which might have been foreseeable and some that might be totally unexpected. One therefore needs to be prepared for this. What would you term as the hurdles on the way to a successful business? Where did you get support? As a small founding team, it is impossible to have experts in all business areas. We are therefore very grateful for the support from our investors and network. We have received exceptional, extremely valuable, and uncomplicated support from the KIT founders’ network, the Center for Entrepreneurship (CIE), the EnTechnon, as well as the Strascheg Center for Entrepreneurship in Munich. How did you deal with the large workloads during start-up? For us, it was of great significance that all pull together as a team. We share the tasks amongst ourselves and can fully rely on each other. When you work together towards a common goal, you rarely feel the extent of the workload. Nevertheless, next to long workdays it is important to embrace social contacts and sports. Neglect these things and you will notice the effects after a few weeks. Do you have any advice for other young entrepreneurs? We would advise that one talks to different people about the idea – this can only make it better. One thing that also helped us a lot is programming a prototype and placing it online in the early development stages as this gave us a basis for discussions with third parties. Based on this prototype, we were able to have totally different talks with partners, investors and potential customers and in the process continuously improve the product. This entry was posted in Gründer des Monats and tagged Anbieter, Anbietervergleich, CIE, EnTechnon, Ferienhäuser, Ferienwohnung, Holiday apartment, Holiday homes, Holidu, KIT start-up, KIT-Gründung, Meta-search, Metasuche, Online service, Onlinedienst, Prototyp, Prototype, Provider comparison, Providers, Reisen, Reiseportal, Strascheg Center, Travel, Travel portal. Bookmark the permalink.